Sebastian Vettel will start on pole for the Chinese Grand Prix, with Mark Webber only 18th, and Jenson Button and Lewis Hamilton second and third. 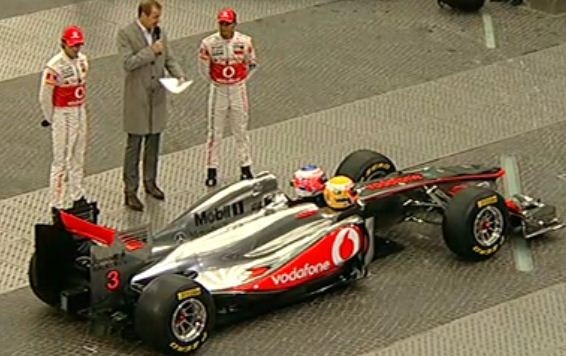 Just been watching the reveal of the McLaren F1 MP4-26. It looks amazing to me – let’s just hope it drives in the same way! Also do I get the prize for the fastest (albeit short) blog posting?? First let’s define what this means: Telemetry is a technology that allows remote measurement and transmission of information. The Greek root of the word is that tele means remote, and metron means measure. Telecommand is, in a way, a response to telemetry, as it means sending a command or instruction. Two way telemetry (telemetry and telecommand) is possible and was originally developed by TAG Electronics. This system started as a way to send a message to the driver to a system allowing the race engineers to update the car in real time, for example, changing engine mapping. However, the FIA banned two-way telemetry from F1 in 2003. F1 teams take a huge quantity of computer equipment to each race to help the drivers and engineers to find the right set-up and cure any car problems. a microwave burst, which is sent as the car passes the pits. This data burst can contain around 4 MB of information giving the engineers a vital insight into the state of the car. The telemetry is transmitted by a small aerial located on the car. This is usually located on the sidepod or wing mirror nearest to the pits. A further 40 MB (or thereabouts) can be downloaded from the car by plugging in a laptop. The socket usually located in the sidepod or near the fuel filler. A bank of computers is used to process the information sent by the cars whilst they are on track. These computers use software provided by companies such as Hewlett Packard, Compaq and TAG Electronics. The software displays the information on screens in a way that can be interpreted by the engineers. During a race, readings such as engine temperature and hydraulic pressure are examined in detail to make sure that a major failure is not imminent. If any readings go above or below what is normally expected, the engineers can radio the driver and, for example, ask them to use less engine revs or brake earlier to try and prevent failure. McLaren have developed their own system called the Advanced Telemetry Linked Acquisition System (ATLAS). This system displays graphs of each of the cars’ systems in real time at all parts of the track. Most of the top teams have similar systems, but it is considered that McLaren’s is currently one of the best. See: http://www.mclarenelectronics.com/Products/All/sw_atlas.asp for more information. Bosch Motorsport is offering a new gasoline direct injection system for use in racing vehicles. With its engine control unit from the MS 5 product family and its HPI 5 high-pressure power stage unit, the refined system incorporates all the electronic components. It also incorporates the complete hydraulic system: the HDEV 5 high-pressure injection valves, and the HDP 5 high-pressure pump with an integrated demand control valve. “Bosch direct injection is the ideal basis for innovative engine designs,” says Klaus Böttcher, the director of Bosch Motorsport. Changes in engine specifications are now being discussed extensively in several racing series. Electrically controlled HDEV 5 high-pressure solenoid valves with multihole technology typically use up to seven individual jets to generate a spraying pattern. Bosch Motorsport advises its customers on injection-pattern configuration and additionally offers individual jet configurations, in which the jet pattern is adapted to the specific geometrics of each engine’s combustion chamber. The HDP 5 high-pressure pump is particularly small and compact. It can be easily connected to the cylinder head and typically generates pressures of up to 200 bar in the fuel rail. The pump is driven by an additional cam on the camshaft. On request, Bosch Motorsport can supply its customers with a variety of cam profiles, which are configured based on the properties of the engine in question. The goal is to increase the system pressure significantly within the next few years. The HPI 5 high-pressure power stage unit makes it possible to control injection very precisely. It uses a three-stage design, which has a separate boost, pick-up, and hold phase, and it uses high voltages and currents to boost the valves. The power stage unit also drives the flow control of the high-pressure pump. The strategy for the flow control of the pump was developed specifically for this application. It includes pre-control and closed-loop regulation. The Bosch Motorsport gasoline direct injection system is based on products which Bosch produces large-scale in series and which are then specially adapted for motorsports. Thus, in every single component, Bosch Motorsport offers its customers expertise from one of the world’s largest suppliers. Bosch Motorsport’s close collaboration with the Bosch series development teams makes it possible to design systems based on customer-specific requirements – systems in which all the components have been programmed to interact efficiently, have been ideally dovetailed, and have been tested. Bosch electronic gasoline direct injection became an immediate success in 2001, when it was first used in the Audi R8 that won the Le Mans 24-hour race. Bosch Motorsport is part of the Bosch subsidiary Bosch Engineering GmbH, an engineering services specialist with headquarters in Abstatt, near Heilbronn, Germany. Williams’ Nico Hulkenberg stunned the Formula One fraternity in the changeable conditions at Interlagos on Saturday afternoon as he fought and beat the Red Bulls, Ferraris and Lewis Hamilton’s McLaren to take pole position for Williams. As the weather showed signs of improving for Q3, the question arose whether anyone might get around to a run on slicks… Sure enough, after Hamilton set the pace with 1m 17.212s on intermediate Bridgestones ahead of Schumacher, Vettel, Alonso and Webber, they ventured out on slicks for their final runs. Hulkenberg was fast all through, and pasted everyone with a final lap of 1m 14.470s to put pole well beyond doubt. Sebastian Vettel and Mark Webber crucially start second and third for Red Bull, in 1m 15.519s and 1m 15.637s respectively, and with Hamilton fourth on 1m 15.747s, Fernando Alonso is only fifth for Ferrari on 1m 15.989s. Rubens Barrichello put the second Williams sixth with 1m 16.203s ahead of Renault’s Robert Kubica on 1m 16.552s, Mercedes GP’s Michael Schumacher on 1m 16.925s, Ferrari’s Felipe Massa on 1m 17.101s and Renault’s Vitaly Petrov on 1m 17.656s. It was the qualifying session of the year! Only 4-stroke engines with reciprocating pistons are permitted. Engine capacity must not exceed 2400 cc. Crankshaft rotational speed must not exceed 18,000rpm. All engines must have 8 cylinders arranged in a 90º “V” configuration and the normal section of each cylinder must be circular. Engines must have two inlet and two exhaust valves per cylinder. Only reciprocating poppet valves are permitted. The sealing interface between the moving valve component and the stationary engine component must be circular. Cylinder bore diameter may not exceed 98mm. Cylinder spacing must be fixed at 106.5mm (+/- 0.2mm). The crankshaft centreline must not be less than 58mm above the reference plane. The overall weight of the engine must be a minimum of 95kg. The centre of gravity of the engine may not lie less than 165mm above the reference plane. The longitudinal and lateral position of the centre of gravity of the engine must fall within a region that is the geometric centre of the engine, +/- 50mm. The geometric centre of the engine in a lateral sense will be considered to lie on the centre of the crankshaft and at the mid point between the centres of the forward and rear most cylinder bores longitudinally. Coatings are free provided the total coating thickness does not exceed 25% of the section thickness of the underlying base material in all axes. In all cases the relevant coating must not exceed 0.8mm. Pistons must be manufactured from an aluminium alloy which is either Al-Si ; Al-Cu ; Al-Mg or Al-Zn based. Piston pins, crankshafts and camshafts must be manufactured from an iron based alloy and must be machined from a single piece of material. A supplementary device temporarily connected to the car may be used to start the engine both on the grid and in the pits. As part of a big update to its car, McLaren introduced a new front wing at Singapore. The new wing has a totally revised stacked element, in fact the one element featured at Spa and Monza is now replaced by two seperate elements. The outer one is a simple, small two-element wing attached to the main front wing endplate. 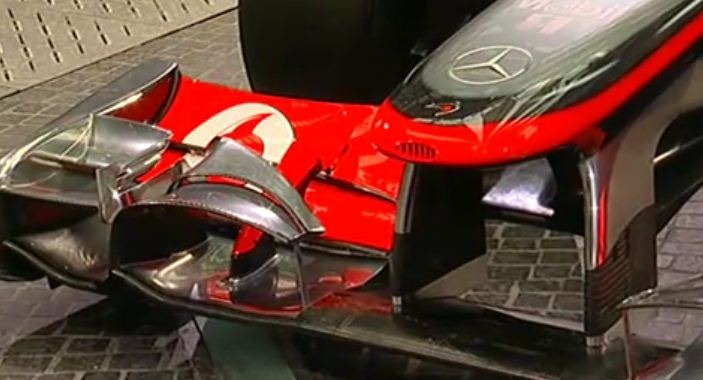 The wing itself has its own endplate as well, as indicated by an arrow. The more inward part of the stacked element looks rather more sophisticated and connects to the wing’s base panel which is now even more curved. Contrary to previous McLaren front wings, the stacked element is now also decoupled from the front wing adjuster, the most inward vertical panel on the wing. Also note that McLaren did not fit the rest of their update package to the car this weekend for reliability reasons. It will be introduced at the next race. Renault has announced that Russian company Vyborg Shipyard JSC has become a team partner for the final five races of the 2010 season.The deal marks the second partnership with a Russian company in 2010 for Renault, following the agreement with Lada.”Both companies have been attracted to the team by Vitaly Petrov’s promising debut season as Russia’s first ever F1 driver,” said the team in a statement.Vyborg Shipyard JSC, one of the largest shipbuilding companies in the North-Western region of Russia, will have its logos featured on the chassis of both cars for the remainder of the 2010 season. Petrov, a native of Vyborg, will also carry the logo on his overalls. The deal comes amid speculation about the future of the Russian driver in the team, with Kimi Raikkonen having contacted Renault over the possibility of a return to F1 next year. Hispania Racing’s Karun Chandhok is optimistic the Yeongam circuit will be ready in time to host the inaugural Korean Grand Prix on 24 October. Chandhok became the first F1 driver to run on the new track, completing 14 laps in a Red Bull car on Saturday. "Everyone has been a bit doom and gloom about it but it’s actually not that bad," the Indian racer told BBC Sport. "The organisers think it’s all within their timelines and are confident that it will be ready on time." A final official track inspection will take place on 21 September, only 32 days before the F1 cars are due out on the Yeongam circuit for the first time. There has been growing speculation as to whether the scheduled race will go ahead because of delays in construction, in particular to the track surface. After running the rule over the circuit, Chandhok said there is still some catch-up work to do but added that the organisers believe the circuit will be ready for Korea to make its bow on the F1 calendar. "If they do everything they have told me that they are going to do then yes [it will be ready on time]," Chandhok continued. "They’ve got to a point now and it is almost like they are doing touch-up work. "They need to put another coating of top surface on the asphalt, the kerbs need some work and there are a few bumps to sort out. "The garages are finished and the pit buildings, which look over the sea, are enormous – I’ve lived in smaller houses! 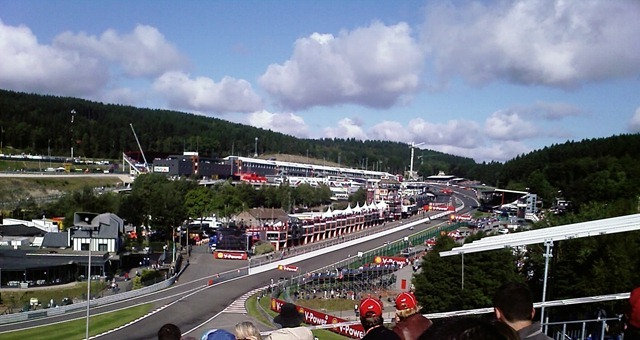 "The main grandstand is finished although they need to put up other temporary grandstands because they don’t have time to put up any more permanent ones. "Admittedly, the circuit isn’t completed yet but there is a circuit for us to drive around." The Korean circuit is the only new venue on the F1 calendar this season and has been designed by Hermann Tilke, the man behind the layouts of the new tracks in Malaysia, China, Bahrain and Abu Dhabi. This was the view (from the official website) of the track in 1970.